The use of artificial breeding facilities (ABFs) such as dovecotes or pigeon lofts as a method of pigeon control is becoming increasingly popular in Europe with many users experiencing astonishing results. This control was pioneered by the Pigeon Control Advisory Service (PiCAS International) in the 1970s as a means of humanely and naturally controlling pigeon flock size without the need to resort to invasive and ineffective lethal controls. In the 1980s the scientific world took an interest in the use of ABFs to control pigeon populations with research* proving conclusively that lethal controls, when used on pigeons, were not only ineffective but may actually have the effect of increasing pigeon flock size. The same research found that ABFs were a highly effective means of reducing pigeon flock size. The use of ABFs as a method of pigeon control is one of the most effective and cost-effective methods of reducing the impact of entrenched area-wide pigeon-related problems for property owners. The principle of this method of control is to provide an artificial breeding facility in which pigeons are encouraged to roost and breed and from which newly laid eggs are removed and substituted with dummy eggs. When eggs are removed they must always be replaced with dummy eggs to ensure that the hen bird does not continue to produce more eggs. If the hen does lay and re-lay every time her eggs are removed this may result in a calcium deficiency in the bird and as the goal is a small and healthy flock of pigeons, health-related issues must be prioritised. ABFs come in two forms; loft-type facilities that would normally be provided on or in a building and dovecote facilities that might be provided in a public park or in similar urban areas where pigeons can be accommodated and tolerated without causing problems. available) pigeons moved inland to exploit these optimum predator-free feeding and breeding opportunities. In the 17th, 18th and 19th centuries man domesticated the feral pigeon for use as a source of food, sport, income and even saltpetre by building large pigeon houses called dovecotes where pigeons were encouraged to live and breed. It is the domestication of the pigeon and the use of dovecotes centuries ago that provided the basis for an idea that has revolutionised the way pigeons are controlled in the 21st century. The use of dovecotes as a pigeon control option is still relatively uncommon, in spite of the fact that pigeons were successfully domesticated and bred in similar facilities centuries ago. The main reason that dovecotes are not used more extensively as a pigeon control option is due to the highly negative press that pigeons have received courtesy of propaganda circulated by the pest control industry and the media’s over-dramatised and often fictional interpretation of it. Pigeons are commonly (but wrongly) perceived as disease carriers and thereby a major threat to human health, but in reality the chances of a human being becoming ill as a result of contact with pigeons or their excrement is virtually zero. Nonetheless pigeons have been given a bad name and that name has stuck, resulting in the public having an unnatural and unfounded fear of contact with pigeons. Even so, it is human beings that are responsible for the huge numbers of feral pigeons that we see in towns and cities all over the world. Deliberate and persistent feeding of pigeons by a relatively small number of people has resulted in pigeon populations dramatically increasing in size and as a result, causing significant problems for property owners. In reality, it is these problems (ie. the soiling of buildings used for perching and roosting) that are the main reason that pigeons are controlled, not the perceived health risks. As pigeon populations are maintained almost exclusively by deliberate and persistent public feeding, the concept of providing a dovecote where pigeons can be accommodated and in which breeding can be controlled, alongside a designated feeding area where the public can legitimately feed pigeons, makes perfect sense. Two significant benefits of this type of control is that members of the public who insist on feeding pigeons are accommodated and the pigeons themselves are provided with a home in an environment in which they can do little if any harm. In the past councils have tried to undertake public education programmes asking or forcing pigeon feeders to stop offering food to pigeons, but these campaigns have usually failed based on a lack of understanding of the problem by those tasked with implementation. Those people that regularly feed pigeons will not stop offering food to pigeons, irrespective of the threat of fines, because they believe that if they do so the birds they feed each day will starve. This is of course not the case, but it is virtually impossible to convince persistent feeders of this. Why? Because although their stated reason for feeding pigeons is to ensure that the birds do not starve, the real reason is because pigeon feeders derive very considerable personal pleasure from the act of feeding and interacting with pigeons. Many pigeon feeders will continue feeding even if they are told that the birds they feed will be culled unless they stop feeding, suggesting that this is a selfish rather than an altruistic act. The principle behind a dovecote-based control system is to identify a green area such as a public park, ideally where pigeons are already being fed. Within this ‘pigeon-friendly’ area a dovecote facility can then be provided adjacent to an area designated for the public to legitimately feed pigeons. A public education campaign is then undertaken by the local council publicising the facility and confirming to the public that the feeding of pigeons is allowed within the designated feeding area, but nowhere else. Anyone caught feeding outside the designated area would be fined. This has the effect of moving both the pigeon feeders and the resident pigeon flock from their existing feeding areas to the designated feeding area adjacent to the dovecote. Then, as major pigeon roosts are closed down throughout the area as a result of council officers using public health legislation to force property owners to exclude pigeons from their properties, pigeons will take up residence in the dovecote adjacent to their food supply. Once the birds are roosting within the dovecote facility they will soon start to breed and once breeding starts, eggs are removed from the dovecote and replaced with dummy eggs. The removal of eggs takes only 5 minutes a week and if the designated feeding area and dovecote are designed thoughtfully and with pigeons in mind, cleaning will be quick and simple. This method of control provides a simple and cost-effective method of resolving the problem of persistent pigeon feeding by the public and the resultant soiling of buildings in town and city centres. For a control system involving the use of a dovecote and designated feeding area to be effective the local council, the only body that can be a catalyst for this control option, must be proactive and listen to advice that is provided to it. Although the PiCAS International offers a completely free service to councils, working alongside them to ensure that the system they choose is offered and implemented as it should be, a majority of councils fail to listen to or act upon the advice provided to them. 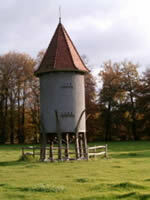 As a result many dovecote-based control systems fail. This is not because there is anything inherently wrong with the concept, it is simply due to a lack of basic understanding about pigeon behaviour (and pigeon control) as well as a naivety of the motivations of the pest control industry on the part of those tasked with implementing the programme. This type of long-term control programme is cheap to provide and extremely effective as a method of control, but it does require the user to think laterally, something that councils are not always renowned for doing. Loft-based ABFs are much more popular than dovecote-based ABFs due to the fact that they can be provided for a fraction of the cost of dovecote-based ABFs and can be provided in areas of a building or site that are rarely used for the purpose of human access, allowing the property owner to utilise redundant space. There are two types of loft-based ABFs; a free-standing ABF that would normally be located externally on a flat roof and a converted roof void ABF that provides accommodation for pigeons internally. Both types of ABF are extremely effective and well suited for use as a means of accommodating and controlling pigeon flock size. The other difference between loft-based ABFs and dovecote-based ABFs is that a loft-based ABF will be site-specific whereas dovecote-based ABFs will be provided as non-specific area-wide controls. Of the two methods, an ABF located within an existing roof void is the most costly and time consuming to provide, but once installed it will provide the property owner with a simple to service facility that will dramatically reduce external roosting-related problems. Each and every internal ABF will be different due to the obvious variations in property size and type, but essentially an internal ABF will be a small self-contained space in which pigeons are encouraged to roost and breed. In order to provide an ABF in a large commercial building only a very small part of the roof void will be required for the purpose and this can be partitioned off easily and cheaply. The most expensive aspect of proving an internal ABF will be providing an entry/exit point for the pigeons. Once this is provided the only other infrastructure required will be a series of compartmentalised breeding boxes and some perches to accommodate non-breeding birds. In an effort to keep costs to minimum, plastic boxes can be adapted for use as breeding boxes with the added advantage that plastic boxes are easy to clean and will help to reduce the potential for insect infestation, thereby maintaining good health within the flock. Boxes would normally measure 30cm x 30 cm x 45 cm but can be made smaller if space is an issue. The floor would either be covered in an easy-to-clean material like linoleum or could be covered with sand, woodchip or sawdust which would be swept up and replaced with reasonable regularity. Once the internal ABF has been fitted with an entry/exit point and suitable breeding boxes and perches, the next step is to attract pigeons into the facility. This is relatively simple and in most cases pigeons will find the ABF regardless of efforts to encourage them. Immediately in front of the exit/entry point a landing tray would be provided upon which grain would be placed for 2-4 weeks. Pigeons will quickly find the food and will almost certainly inspect the ABF at the same time. As an internal ABF offers the feral pigeon what would be considered to be an optimum roosting and breeding facility, there will be rapid take-up of the accommodation on offer. Once pigeons are breeding within the ABF, eggs are removed and replaced with dummy eggs once or twice a week - in every other respect the ABF is self-contained and requires little or no maintenance. This control will continue to be effective indefinitely and after the initial investment, there will be little or no further costs associated with the ABF other than cleaning. The other type of loft-based ABF is an external facility that can be sited on a flat roof area or even sited within a disused area of a building. Although a tailor-made loft can be provided, it is far easier and cheaper to convert a basic garden shed for the purpose. The main benefit of an external loft, particularly if a standard garden shed is used, is that it can be moved from one part of the building or site to another if the original site that was chosen proves to be unsuccessful. A standard 2.4 m x 1.8 m (8’ x 6’) garden shed is an ideal size for an ABF although larger or smaller sheds would serve the purpose just as well. The shed should have a door at one end and no windows. A long slit is cut into the sidewall of the shed as an exit/entry point, just below roof height, measuring 15cm high (6”) and provided along 2/3 of the length of the sidewall. 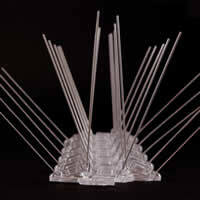 Immediately below the entry/exit point a tray is provided that will act as a combined landing stage and feeder, measuring approximately 15cm (6”) deep and provided along the entire length of the opening. The interior of the ABF should be fitted out with plastic (or wood) breeding boxes measuring 30cm x 30cm x 45 cm which can be easily attached to the interior walls of the shed at height. If using wood to compartmentalise the interior it should be noted that pigeons prefer privacy from their neighbours when breeding so install dividers between the cubicles. The floor of the shed can be covered with linoleum, sand, woodchip or sawdust for ease of cleaning. Once the ABF has been sited in an appropriate area of the site, ideally where there is existing pigeon activity, there is little more to do other than to monitor the ABF to confirm whether pigeons are using the facility. Once there is definite activity within the ABF a programme of weekly or bi-weekly visits should be made to remove and substitute eggs. If the ABF is not used within 2/4 weeks of siting, it should be re-sited in another area. Although it is not essential to install anti-roosting devices in an effort to force pigeons to explore and use the ABF, there is no doubt that it may speed up the process. Where there is an existing problem with pigeons on the building or site concerned it is critically important to ensure that if anti-roosting products are installed, they are installed after the ABF is sited, not before. This is because if the ABF is sited after the installation of anti-roosting products it is possible that the excluded birds will relocate elsewhere on the building or site potentially rendering the ABF redundant in the area chosen to install it. If the ABF is sited before anti-roosting products are installed, pigeons will almost certainly move directly into the facility. ABFs can, in reality, be any shape or size and can be provided internally or externally depending on the budget available and the availability of suitable sites. 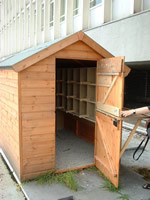 If a little imagination is used a system of ABFs can be provided at no cost at all, as was the case at Nottingham City Hospital where old staff lockers were turned on their sides and installed on roof areas to encourage pigeons away from their existing roosts in sensitive areas of the site. Pigeons had no hesitation in using these facilities for the purpose of breeding once they had been excluded from their existing breeding sites. If the site or building concerned has little free space in which to site a loft-based ABF, wall-mounted breeding boxes can be provided at little cost. 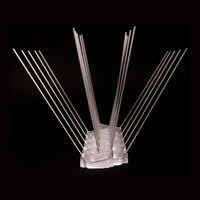 Wall-mounted breeding boxes can be tailor-made to fit any area or space available. The permutations are endless once it is understood that pigeons will readily breed in virtually any receptacle that is provided for the purpose, providing that a few basic rules are followed. Anyone considering the use of ABFs should be aware that it is an offence to interfere with the nest of any breeding bird in the UK, irrespective of its status and classification within the Wildlife and Countryside Act 1981, without a licence. Prior to undertaking any scheme involving an ABF it is strongly recommended that DEFRA is first contacted to seek permission to remove and replace eggs. Prices for dovecotes and ABFs vary dramatically ranging from £20-£30 for a wall-mounted breeding box, £200-£300 for a garden shed and several thousand pounds for a large commercial sized dovecote that might be provided in a public place. 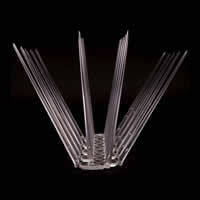 With a little imagination ABFs can cost nothing at all if scrap materials are used to produce them. One of the most successful loft-based schemes to be undertaken in the UK was provided by the management of Nottingham City Hospital (NCH) in conjunction with the Pigeon Control Advisory Service International (PiCAS International). In 1999 NCH undertook a controversial cull of pigeons on the extensive NHS site at the recommendation of their pest control contractor. As soon as the culling was underway the hospital received a barrage of complaints from staff, the general public and animal rights groups about the use of inappropriate lethal controls. NCH brought PiCAS International in to advise them on non-lethal but effective controls that could be used to reduce the estimated 1200-strong flock of pigeons resident on the site. PiCAS International recommended a mix of ABFs and anti-roosting products to be installed on the site in an effort to reduce flock size. NCH agreed to cease all culling on the site and implement the PiCAS International recommendations to the letter. Since contact has been made with PICAS and a visit made by Guy Merchant (Director of PICAS), several new schemes have been in progress. Firstly, lethal culling has been suspended indefinitely. We have now employed an on-site Pest Controller, Mr. Martyn Belcher to control the pigeon population. Having taken advice from PICAS, and from the catalogues recommended, Martyn has pigeon proofed many areas, at a greatly reduced cost, as opposed to using private contractors. Martyn has developed the concept of pigeon coups by using old staff single lockers turned on their side and compartmentalised them into nest boxes. The sites chosen are large bird populated flat roofs on 3 buildings in the Trust. Martyn leaves food, water and nest materials to encourage the birds to nest, then removes the eggs. He has also mapped out the nest sites on the Trust and visits these areas daily to collect eggs. Obviously if the eggs have hatched the young are left alone to fledge. The impact on the Trust has been dramatic. In less than a year, the bird population has reduced by an estimated 50%. The cost of cleaning fouling has also reduced significantly. Future plans include the roll-out of more coup areas, which have no cost or maintenance as we are recycling old lockers. We are however, having a wooden coup made by our Estates Department, which will be near to our wildlife corridor. Here again, the eggs will be collected. This approach is both user friendly and non-lethal. We will continue to develop our strategy and monitor the effectiveness of the scheme. A further report will be sent to PICAS in the Autumn. Another NHS hospital, Heath Park Hospital (HPH) experienced similar success with ABFs provided to deal with deeply entrenched pigeon-related problems on-site. As with Nottingham City Hospital, HPH was advised to undertake a pigeon cull in 1998 by its pest control contractor with horrific results. An elderly patient recovering from a serious operation witnessed a pigeon on the ledge outside the ward window explode into a mass of feathers as it was shot by a pest controller as part of the cull. Animal rights groups were informed and the local media reported the cull resulting in highly damaging publicity for the hospital, as was the case with Nottingham City Hospital. The hospital management brought in PiCAS International to advise and a system of ABFs were provided alongside the installation of anti-roosting products. The hospital management also agreed to cease all culling on the site to pacify staff, the general public and animal rights groups. Two loft-based ABFs were provided on site in locations close to sensitive ward areas where overnight roosting was considered to be an extreme problem. The results were dramatic. Within 2 months of providing the ABFs the on-site volunteer, who was servicing the lofts on behalf of HPH, was removing in the region of 40 eggs a week from the ABFs and pigeon uptake in both ABFs was extensive. Not only did the ABFs act to reduce flock size by egg removal and replacement, but roosting-related problems in areas adjacent to where the ABFs were sited, also reduced significantly. This scheme proves just how effective ABFs can be when used to resolve entrenched roosting-related problems. In this case the pigeons that took up residence in the ABFs were not excluded from their roosts by the provision of anti-roosting products, they chose to roost and breed in the facilities of their own volition. (The removal of 40 eggs a week means that, in real terms, approximately 36 young birds were taken out of the system every week once juvenile mortality has been taken into consideration). When it is understood that juvenile pigeons can breed in their first year of life and can produce up to 16 young a year in optimum conditions, the removal of 144 pigeons a month must be seen as a huge reduction in flock size. trialled a hand-held sonic/bio-acoustic device called ‘Pigeon Patrol’, manufactured by a British company and costing in excess of £600 per unit. The two ‘Pigeon Patrols’ bought by the hotel had been totally ineffective and the hotel management was forced to resort to asking a member of staff to run around the site waving a red flag all day, which was considerably more effective than the bio-acoustic devices had been. of the resident pigeons were roosting. These lofts were made in-house and designed to neatly fit underneath a small overhang, thereby utilising redundant space. This simple and inexpensive control option has provided the hotel with a humane and effective means of reducing pigeon flock size indefinitely without the need to resort to ineffective and invasive controls such as culling. Surrey Heath Borough Council (SHBC) confirmed the success of its ABF via a statement in its 2006 magazine. 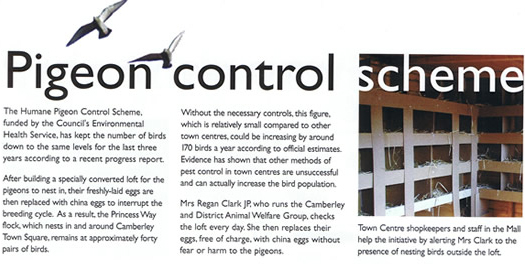 In 2001 SHBC met with representatives of Camberley’s animal welfare group, Camberley and District Animal Welfare Group (CADAWG) and the Pigeon Control Advisory Service International (PiCAS International) to discuss the issue of feral pigeon control in Camberley town centre. SHBC was looking for a humane and non-lethal resolution to its town centre pigeon problem. After a day of talks which included an exhaustive survey of Camberley town centre, PiCAS International made recommendations that included the provision of a loft-based ABF sited on a flat roof area adjacent to Camberley’s shopping centre. PiCAS International also recommended that SHBC roll out a public education campaign alongside an initiative to persuade local retailers to pigeon-proof their properties. CADAWG agreed to service the ABF and assist SHBC with a public education campaign and The Mall Shopping Centre agreed to provide a site for the ABF in the area identified by PiCAS International. SHBC agreed to fund the cost of the ABF itself and also pay the annual insurance costs for the loft. This non-commercial joint initiative between PiCAS International, a local animal welfare group, a shopping centre and the local authority proved to be a considerable success with SHBC announcing, in 2006, that Camberley town centre’s pigeon population had reduced down to 40 pairs of birds from upwards of 200 in 2001. Not only this, but flock size has now stabilised at 40 pairs and SHBC confirmed that this figure has remained the same for the last 3 years. This extraordinary success was achieved without killing a single pigeon and has provided both SHBC and town centre property owners with considerable relief from the pigeon-related problems that they had been experiencing. This forward thinking and community-based pigeon control initiative, provided jointly by SHBC and CADAWG, represents the future where the successful resolution of entrenched urban pigeon-related problems is concerned. Using outdated and deeply unpopular lethal controls can no longer be considered to be effective or socially acceptable as a means of controlling pigeon flock size. ABFs are clearly an extremely effective method of pigeon control that can be adapted for use in virtually every application courtesy of the numerous types of facilities that pigeons are prepared to use for the purpose of breeding. For local authorities, whose responsibility is for area-wide rather than site-specific controls, a dovecote and designated feeding area will not only resolve perching and roosting-related problems but will also resolve the difficult issue of deliberate and persistent feeding of pigeons by the general public . For a property owner whose responsibility is for a site or individual building, a loft-based (internal or external) scheme can be relatively inexpensive and offers an effective means of resolving roosting and perching-related problems. There are many positives associated with schemes involving ABFs and very few negatives, as there inevitably are when attempting to reduce pigeon flock size by the use of lethal controls. As can be seen from the 3 user reviews, if advice is sought and followed and if the user is prepared to make a long-term commitment to providing a system involving ABFs alongside the application of anti-roosting products where required, the benefits are considerable. The benefits are not only restricted to a reduction in flock size however, as can be seen from the enormously positive publicity showered on Surrey Heath Council (SHBC) following their successes with an ABF provided in Camberley town centre. SHBC identified that a problem existed in Camberley town centre and rather than ignoring the problem, or employing quick-fix tactics such as culling to resolve the problem, they chose a humane and effective method of control that was clearly in tune with public thinking on the subject. As a result, SHBC have been praised, not only as being one of first local authorities in the UK to use this method of control but because the authority was prepared to allow the scheme enough time to prove its effectiveness. Councils like Bedford Borough Council, Chester City Council and Kirklees Metropolitan Council have all provided watered down versions of these schemes that have failed, due in the main to a lack of attention to detail combined with a lack of preparedness to take advice and see the schemes through to their natural conclusion. ABFs are not a short-term quick-fix like culling but offer the user a dedicated and user-friendly control that will continue to reduce flock size indefinitely and at a price that is affordable. ABFs represent the future where pigeon control is concerned and once the pest control industry makes the difficult transition to stop recommending outdated lethal controls and offer their clients humane and effective control options such as ABFs, pigeon-related problems may start to become a thing of the past. We have only scratched the surface of this control option in this review and we would strongly advise anyone that is considering this method of control to contact the Pigeon Control Resource Centre for further information.